In all sorts of goals we want to achieve, planning and preparation are essential as these serve as the foundation of the tasks that you need to do in order to reach those goals. Without proper planning, achieving your goals would be difficult. You will probably do other things not in line with your goal and end up accomplishing anything else rather than your goal. Moreover, there is a greater probability that you will get easily distracted to do other matters because you do not know which way to take. To prevent this to happen, entities plan on the things they have to do in order to effectively achieve their goals. Planning may be strategic, tactical, or operational. In this article, we will discuss the strategic plan, the plan we need to prepare for long-term goals. 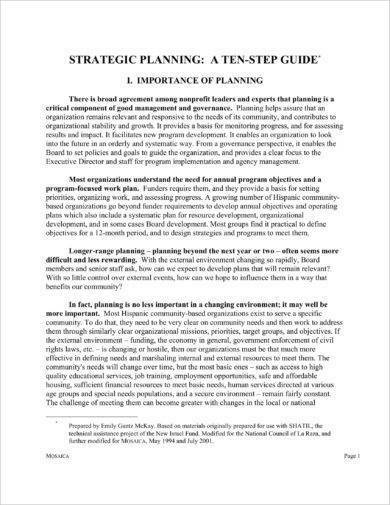 Below are examples of brief strategic plan that you might find useful. assesses and adjusts the organization’s direction in response to a changing environment. It is a disciplined and collective effort of the members of an organization that produces fundamental decisions and actions that serve to guide what an organization is, who it serves, what it does, and why it does it. Your strategic plan must be organized well in order for you to easily access and scan through it. Here are the usual sections contained in a strategic plan. In this section, you will summarize each of the other sections of your plan. Hence, your executive summary should be completed last. This is important for the employees, advisers, investors, and other related parties to understand and support your plan. You may also see sales strategic plan examples. 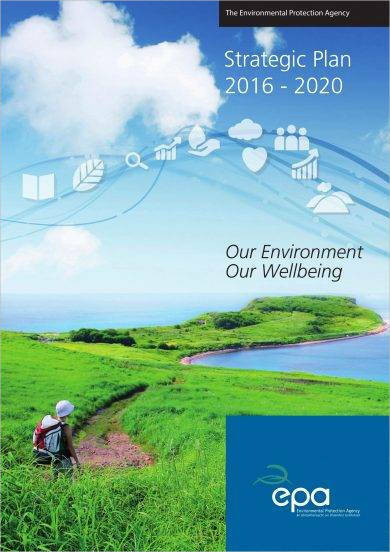 An executive summary will also give an overall background and overview of the whole strategic plan. 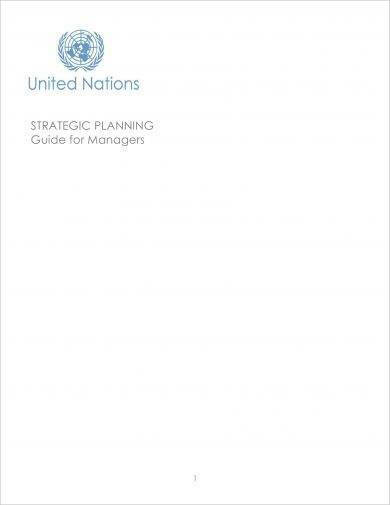 With the executive summary, they can easily understand and see the whole picture of the overall strategic plan without anymore browsing through the other sections although the other sections contain a complete and detailed discussion of a certain topic. This pertains to a brief description of the idea or the overall strategic plan, explaining it in a way such that any listener can understand it in a short period of time. The term “elevator pitch” is coined simply because a certain journalist would like to talk with his editor in chief but do not have ample time to do so. He would just insert into the busy schedule of his editor in chief and would join her during short period of time she had such as an elevator ride. 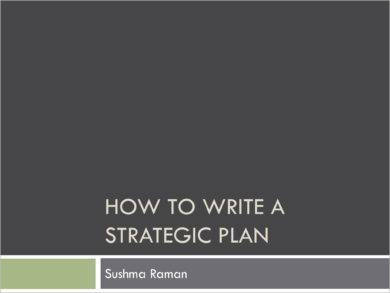 You may also like HR strategic plan templates. 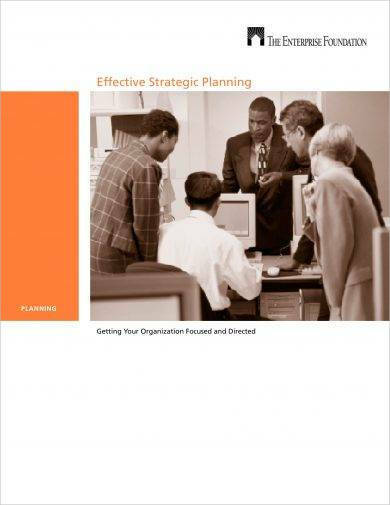 In this section, you must include a brief description of your strategic plan and should be updated annually. It is important that you clearly and concisely articulate your general plan to the other users or readers for them to understand what you are trying to explain in a single glance. The mission statement of your organization will explain what your business is trying to achieve. It serves as a guide for your employees or coworkers to make the right decisions with regard to achieving your goals. On the other hand, it also serves as an inspiration for external parties, such as investors, partners, customers, suppliers, and the government for them to take the necessary actions in dealing with your entity. You need these people to keep your entity going; hence, make sure that they understand what you are trying to achieve by providing them a clear mission statement in your strategic plan. Including a SWOT analysis, or the analysis of your strengths, weaknesses, opportunities, and threats, in your strategic plan is needed for you to determine what are your positive possessions that is helpful to improve your company, the weaknesses of your company so that you can take the proper action to eliminate or minimize those weaknesses and turn them into strengths, the opportunities that you must not let pass as they may help boost your entity or organization, and lastly, the threats that you are facing and how to solve them. A critical element of your strategic plan and the element is present in any strategic plans is your goals. Naturally, an organization is created to achieve certain goals, and setting and achieving them is the hallmark of every successful company. For your strategic plan, this means that you have long-term plan for your long-term goals. 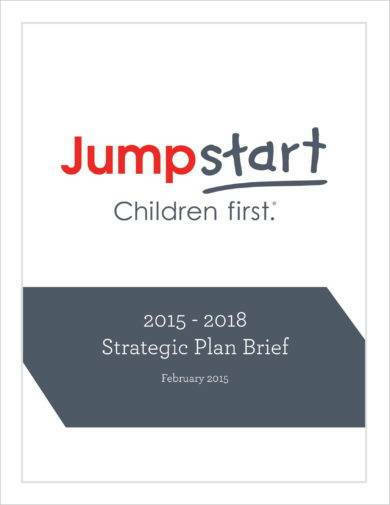 You may also check out personal strategic plan examples. You must first identify your long-term goals before your short-term goals, the goals that you must achieve for the next year, for you to become a successful entity. After, you can set your weekly and monthly goals which are all in accordance and in line with your long-term goals. Key performance indicators are used to quantify or measure and evaluate the success of an organization in meeting objectives. The common performance indicators are the profit of the entity, cost, actual vs. expected revenue, cost of goods sold, day sales outstanding, sales by the other branches of an entity, and actual vs. budgeted expenses. 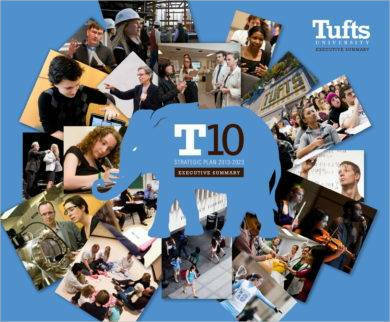 You might be interested in recruitment strategic plan examples. There are also certain indicators, an outside factor, that you can use as a key performance indicator such as customer lifetime value, customer acquisition cost, customer satisfaction, new promoter score, and number of customers buying your items or visiting your shop. Other key performance indicators include customer support tickets, percentage of defective products, efficiency measure, employee turnover rate, percentage of response to open positions, employee satisfaction, retirement list, knowledge achieved with training, internal promotions vs. external hires, salary compensation ratio, customer churn rate, contact volume by channel, percentage of customers who are extremely satisfied, number of new vs. repeat visits, cash flow from financing activities, average annual operating expense, earnings before interests, taxes, depreciation and amortization, innovation spending, and customer value. You must clearly identify your target market in order for you to know what would you like to do to satisfy their needs and wants. You must also have clear understanding on the needs of your target market so that you can specifically address their needs. Without clearly identifying your target market, you do not know whom you are going to offer your products or services. You will be blinded on where to launch or establish the location of your business. It is ideal that you establish your business near your target market. 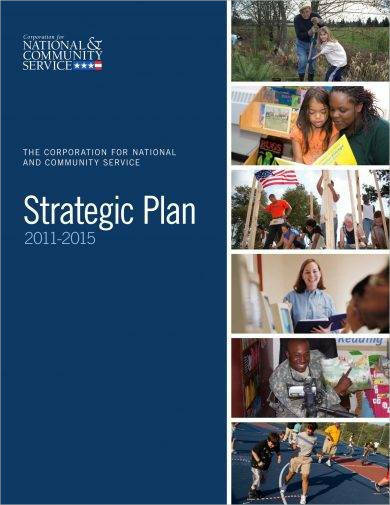 You may also see department strategic plan examples. Furthermore, apart from your industry analysis, you must also present a competitive analysis that defines who your key competitors are, their strengths, as well as their weaknesses. Again, this does not have to be a thorough report that lists every detail about every competitor. Only include those that are significant and affects your entity. You can use this analysis to determine your advantage or edge over them and create ways to develop additional advantages. You must also develop your comprehensive marketing plan that presents how you will attract prospect client, convert them to customers who would buy your products and become loyal to your company, and maximize your lifetime customer value. You may also include a summary of this marketing plan. This section must present the human resources that could help in the execution of the opportunities you have identified and to achieve the professional goals you established. You must list the current member and identify if there is still a need for you to hire people on your team. You must also include your operations plan as this will help you transform your goals and opportunities into reality. In this section, identify the individual projects that comprise your larger goals and how these projects will be completed. You can map out each of your specific activities needed to be taken using a Gantt chart for you to know when each project will start and end and who will lead such projects or activities them. Lastly, in the final section of your strategic plan, you must present your financial projection. It can help in a lot of ways, for example, it can help to assess the potential results for each opportunity you consider pursuing. Through your financial projections, you can easily map out the goals because you already know how much your plan would cost as well as the probability that you can achieve a certain amount needed to achieve your objectives or goals. Every entity needs to have a strategic, tactical, and operational plan, each of which has different purposes it serves to achieve the goals of the company. In creating a strategic plan, you must lay down your strategies well and organize them into different sections for comprehensibility and easy access of the users. 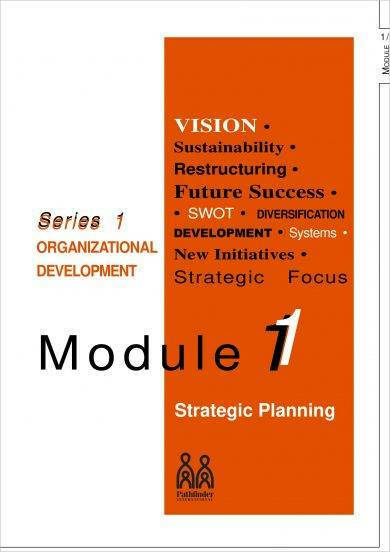 The sections to be included in your strategical plan are as follows: executive summary, elevator pitch, mission statement, SWOT, goals, KPI, target market, industry analysis, competitive analysis and advantages, marketing plan, human resource, operations plan, financial projections. Knowing the contents in a strategic plan, you now have an idea what to include in a strategic plan that you can use whenever you are to make your own strategic plan. 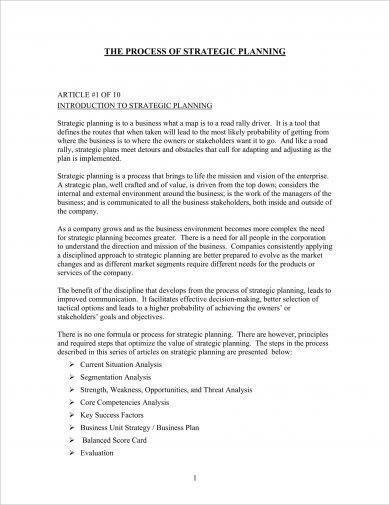 The examples of brief strategic plan above would also serve as your reference whenever you need to refer to some works for your simple strategic plan.